Home > Books > Martin Bridge: Onwards and Upwards! 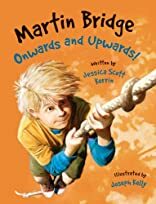 Martin Bridge returns for more slice-of-life adventures in this installment in the widely acclaimed chapter-book series. In "Keyboard," Martin's summer is off to an unharmonious start when his best friends Alex and Stuart are grounded for accidentally damaging Polar Pete's ice-cream truck. Meanwhile, Martin's Mother won't stop practicing on her new electronic keyboard -- and she's driving him around the bend. He's so grumpy that he doesn't feel like helping his friends when they come up with a water-sprinkler-symphony scheme to help pay for their accident. Will Martin change his tune and add some much-needed harmony to his summer? In "Rope," Laila Moffat joins the Junior Badgers, much to Martin's chagrin. A keener and know-it-all, Laila just wants to win more badges. Martin doesn't plan to make it easy for her. Though Laila ends up proving herself Badger-worthy, Martin sure doesn't treat her like a friend should. As the competition for more badges begins to heat up, Martin finds himself with conflicting loyalties.